BS Stainless is dedicated to ensuring the professional quality of our products. When you purchase any of our vast range of stainless steel materials and components, you can be 100% sure that they have been tested extensively before they reach you, in order to give you the peace-of-mind that you need when working on any project. As part of this dedication to quality of materials, we have recently invested in a state-of-the-art testing machine: the performance-leading Thermo Scientific Niton XL2 GOLDD analyser. We purchase our stainless steel from a number of producing mills. Before it reaches us, the materials are routinely tested and certified at these mills but BS Stainless take it a stage further and carry out more testing in-house. This re-testing takes place as soon as we receive the material and again before it is sent out to the customer, ensuring beyond doubt that the quality of the material is nothing less than perfect. There is no visual difference between 304 and 316 grade stainless steel. This means that testing is essential and there is no easier way to carry out the test than with an analyser specifically designed for this purpose. Without testing and analysis, any issues with material content would not be noticed until corrosion or outright failure occured. Priced in the region of £25,000, the XL2 GOLDD analyser is the most up-to-date metal testing machine on the market. It functions as much as ten times faster than conventional Si-PIN detectors and is also up to 3 times more precise than conventional silicon drift detectors. These stunning improvements are achieved via the combination of a 100 μA x-ray tube and closely-optimised geometry, along with patented signal-processing software and hardware. 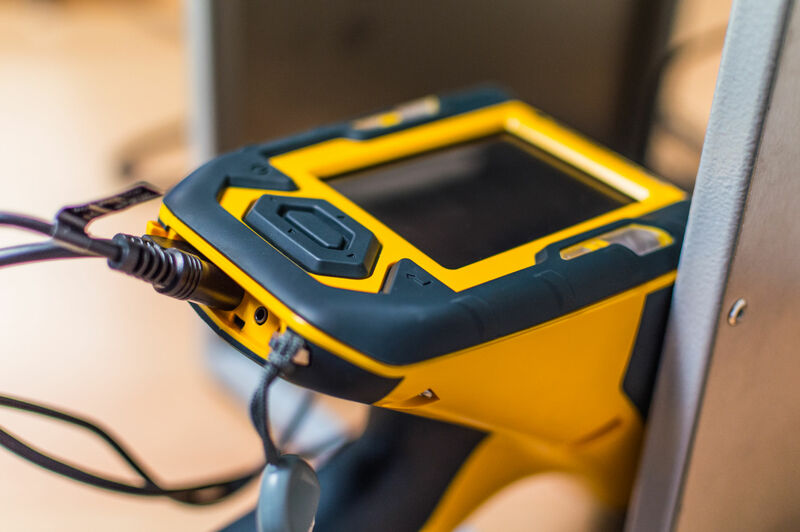 The handheld XL2 GOLDD analyser features one of the biggest commercially-available drift detectors, delivering superlative performance; analysis is extremely precise thanks to ultra-low detection limits. Its analytical range spans more than 25 elements, including uranium, magnesium and lead. Unparalleled accuracy means that we can be confident of a true, detailed content analysis, eliminating the potential for misid­en­ti­fica­tion of value, residuals and grade. You can rely on BS Stainless to deliver the best and our acquisiton of the new XL2 GOLDD analyser is just one way in which we ensure quality products for professional applications. Browse our selection of products today and do not hesitate to contact our expert team for advice, information and technical support. BS Stainless: Your partner for stainless steel.